I LOVE pasta! I mean, who doesn’t?! It can be made into so many different recipes – from salads to main courses, and is always delicious!! I mean, yes, they have carbs, but this girl needs them in her life because I cook with them ALL the time. In fact, now that I think about it, we usually have pasta at least once a week. From Spaghetti to Fettuccine Alfredo, it’s something the whole family loves so we have it quite often. This next dish is another one of those dishes you can add to the meal plan, because it’s simple and definitely delicious. 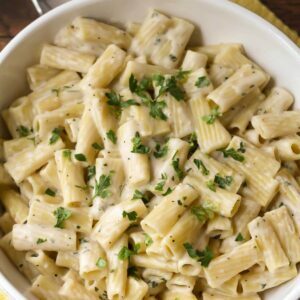 This Creamy Garlic Penne Pasta is a white sauce pasta that is great on it’s own but could be even heartier if you add chicken or another favorite meat to eat. One of the main reasons we love this dish is because it’s simple and quick! You can make it start to finish in about 20 minutes. That’s my kind of dinner recipe! 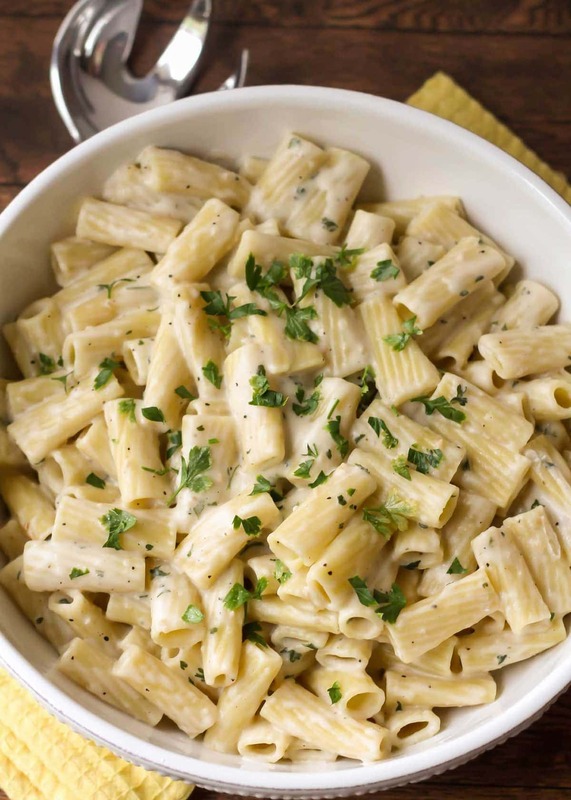 Just follow these easy steps to make this creamy pasta sauce which can be added to any pasta. Begin by cooking the pasta according to the package instructions (we used penne). While pasta is cooking, melt butter in a medium sauce pan, add garlic and cook for 1 minute over medium heat. Add flour and cook for an addition minute, stirring constantly. Add milk and broth, stirring constantly. Cook until sauce boils and thickens. Add parsley and parmesan cheese, salt and pepper. Stir until cheese has melted. Mix in pasta and serve immediately. If you want your pasta to be extra cheese, add 1/2-1 cup of your favorite shredded cheese (we like to use shredded Mozzarella or Parmesan). We typically reheat this pasta in the microwave, but this can also be done in a pot on the stove. You may need to add a little more broth if too thick when reheating. Just another quick, easy dinner meal! We hope you love this easy pasta dish. Melt butter in a medium sauce pan, add garlic. Add flour and cook for an additional minute, stirring constantly. Add parsley and parmesan cheese. Add desired salt and pepper. Continue stirring until cheese has melted. Serve immediately. Amy, how did you pin it? I don’t see that option. Thanks! You will have to let me know if you give it a try. We love it! Thanks for stopping by!! This looks great! I just have one question. Does it matter what type of milk you use?I only usually have 1 % milk. Thanks! Pasta is my weakness. This looks super simple and delish! Pinned!! Found you on the Made by you Monday link party. Love the garlic penne. I pinned it and started following you on Google +. I’ve made this twice already and both times it was great! The first time I added some veggies and the second time I threw in some veggies and shrimp. This is now on my list of dinners to make when I need something quick. I think my favorite thing is that I always have all of the ingredients on hand. Don’t you love simple and delicious recipes that you always have the ingredients on hand for?! And great idea to add veggies! I love pasta! Just wondering, how many does this serve? I made this last weekend, tossed it with chicken, it was soooooo good! I’m making it again this weekend. We had enough left over for lunches for the week, too! Great recipe, thank you so much! Hi, Dawn! Thank you so much for sytopping by. Glad you liked this. Reminded me that I need to make it again soon too! Happy Thanksgiving! Very easy and delicious recipie! I’ve made cream sauces in the past that just didn’t work for me. This one worked great! I used powdered garlic (didn’t have fresh on hand), half and half cream as I was trying to use it up, and dill instead of parsley. Would go excellent with chicken! All your substitutions sound amazing! This is a recipe we love too – so glad you like it! I just found this recipe and I plan to make this dish tonight! Since it’s just me, I probably will only cook half of the box of pasta…. would I need to scale back the ingredients if I do? Thanks! Hi! I’m from Europ and I’m not sure about tsp and TB. Does it mean teaspoon and tablesoon? Thank you so much!! Just made this for dinner and it was amazing!!! Everything turned out great! I found this recipe the other day on Pinterest and just made it tonight. I added a little more butter (because my family uses skim milk) and simmered all the ingredients a couple of minutes extra for each step. This recipe was absolutely heavenly! It was really simple and super delicious! How many does this serve and do you think it would go well with Italian Sausage? I usually don’t comment on any website. But this recipe is one of the best things I’ve ever eaten in my entire life!! It is so simple and doesn’t take a long time to do! I’ve done it like 5 times this month! Mine turned out to be brown sauce…why? I’m guessing you might have browned the flour too much. You really want a blonde (or slightly less) roux, so make sure you have your liquids ready before you add the garlic and flour. Adding the liquids is what will stop them from Browning. I agree, Chris. It probably burned a little. I like to have everything ready & I don’t leave it, once I’ve started, because it can, quick. Loved it! Added some fresh sliced baby Bella mushrooms. Turned out fantastic! Sure to be showing up on our table again. ???? Thanks for sharing this simple and delicious recipe! I added leftover chicken. Could have added some veggies too, but didn’t this time around. Chicken would be great in there!! It’s a great versatile recipe:) Thank you for trying this recipe! 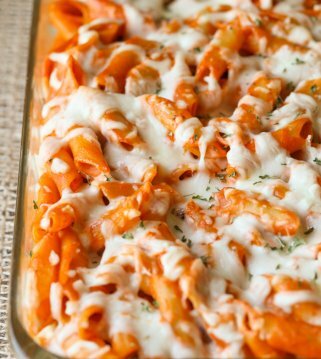 Looks great but that is rigatoni pasta not penne. Came here to say the same thing. Lol! This sounds amazing! Can I substitute a different broth to accommodate vegetarians? Of course, though I haven’t tried that. If you do, let us know what you used and how it came out! Thanks so much and enjoy!! This recipe is delicious! I made it for my husband tonight, however I did substitute Mozarella cheese for Parmesan. Thank you for the delicious recipe, it is going in our keeper file! Made this recipe tonight for my husband and son and they absolutely loved it! This recipe was very delicious…!!???????????? Thank you. This looks really yummy-going to try this soon! It is..Let me know what you think 🙂 Thank you! this exceeded my expectations! yum! I used half a cup of whole milk and half a cup of half and half. I didn’t have broth, so I substituted white wine. I added salt and white pepper to taste. I also added a dash of garlic powder to taste, at the end, to emphasize the garlic flavor. I ate this on top of pasta with peas! tastes great with and without the peas mixed in the sauce. this was quick and easy to make. the sauce came together nicely. the consistency was very creamy. my only complaint is that my stomach isn’t big enough to eat more! LOL!! I am so glad you tried it and loved it!! I love the changes you made. I’ll have to try your way 🙂 Thanks so much for sharing! This is the first pasta recipe I have ever followed, in fact the first recipe in general I’m just learning to cook. I’m really happy I found this, the pasta was fairly easy to make, and tastes delicious 😀 Will definitely be cooking this when I go to uni next year, thank you for sharing! You are so welcome!! I am so glad you found it easy 🙂 I have tons of super easy & quick recipes, so keep checking back 🙂 Thank you! except that’s rigatoni, not penne, but looks good! This really looks delicious that it made me crave for pasta. Off now to the grocery store to get some ingredients and try this. Yay!! I hope you like it! Pasta is a favorite around here! Thank you! 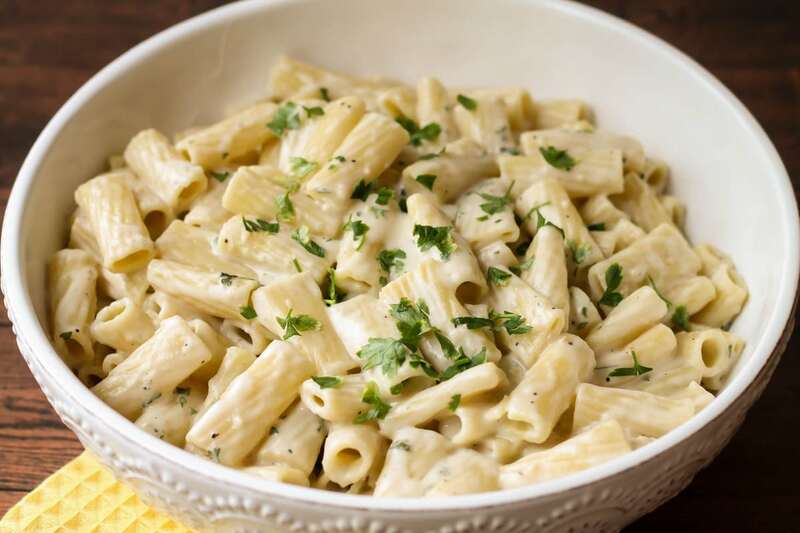 Looks great but thats not penne pasta…. Penne pasta has pointed ends…. that’s rigatoni I believe. Just wondering if this meal freezes well. If I were to freeze it, should I add a bit more sauce? I personally haven’t tried, but it should 🙂 I would add a bit more sauce. Let me know what you think 🙂 Hope you like it! Made twice. Came out perfect. Very delicious pasta. My daughter loved it a lot .Thanks. Loved this! Absolute heaven! I used stock and evap milk (not because I am fancy…it’s just all I had????). Thanks for this simple recipe…great for a busy mama! Glad you improvised! Thanks for sharing! Does it have to be chicken broth what’s another option? I haven’t tried using anything else. You could try another broth? Whichever one you like best. What kind of butter should I use when I cook pasta please? I’m Asian and I don’t usually use butter so I don’t know which one is good. You don’t cook the pasta in butter. You cook them in boiling water, but you do start making the sauce with butter, 3 tablespoons. I just use cubed butter for that. Hope that helps!! Good luck! Fiance and I absolutely love this dish. So simple but sooo good. We eagerly await trying more of your recipes! I love it! And trust me I am such a tough critic to my own makings… But I devoured this pasta as if it were made by a top-notch chef! And yes it was so quick and simple to put together; I was super stoked! I loved it without but just for protein I added chicken breast! Yay!! Love to hear that!! Thank you! It was good, I have a big family i doubled up on the ingrinternets. I added a cup more of flour and a cup more of chicken broth. It thicken nicely. 4 out of 5 kids under 9yr liked it! But 5yr kid is going through a picky stage. Over all we give it a thumbs up. Yay! I know all about that picky stage! Thank you! I just made this last night for my boyfriend and son and they loved it! his son wanted a second plate plus take the left over for lunch! Thank you so much for sharing! Woohoo! That’s what I love to hear 🙂 Thank you so much! Thanks for this great recipe! It’s so easy to make, especially since most of the ingredients are staples in my kitchen The only thing I did different was add peas and cubed ham. I followed the recipe exactly and I almost ate the whole thing myself! LOL!! Good idea about adding ham & peas! That’s why we love it, too..common ingredients! Thank you! Let me know what they think 🙂 I hope they like it, as much as we do! Thank you! Thank you for sharing these wonderful recipes. I only signed up to your web site a few weeks ago and welcome your emails. I even made your recipe for Creamy Tomatoe Soup and it was Deeeeeelish!!! I don’t like to cook and I’m not very good at it but I love food! 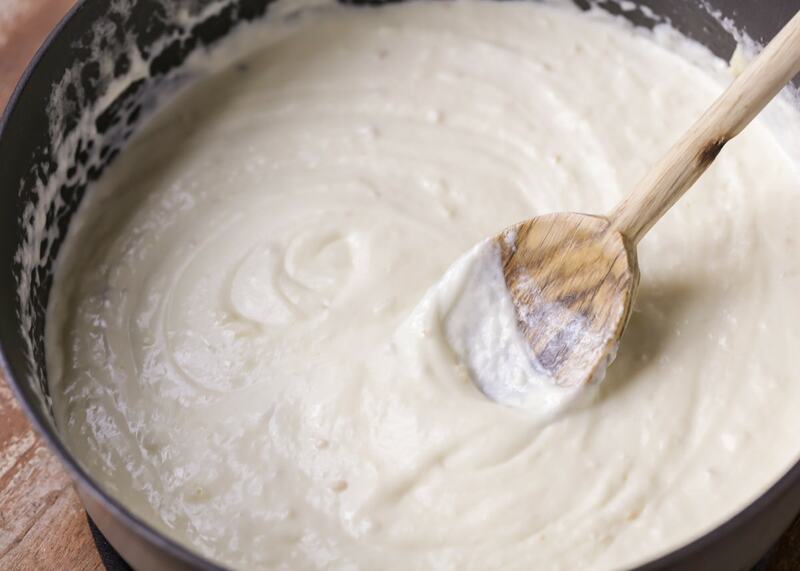 This recipe is the easiest white sauce recipe to make and it taste very, very good!! It only needs a few ingredients and once you begin cooking, it goes smoothly and fast. I highly recommend. Your recipes look great! I printed out some. I can’t wait to try some of them in the school cafeteria where I work. Thanks for sharing your recipes. You are so welcome & thank you!! I hope the kids like them 🙂 Let me know what you hear! I’m planning to make for dinner today. Can I leave the sauce at room temperature? I am so sorry to have not responded sooner. It should have been ok:) What did you think? love it, i do it now, This is now on my list of dinners to make when I need something quick. Thanks so much!! Hope you give it a try! I made this tonight. I added chicken, shrimp, red, yellow and orange peppers, mushrooms, a variety of different colored cherry tomatoes, brussels sprouts, broccoli, and asparagus. My family absolutely loved it! Sounds great!! Thank you for sharing! This was so delicious and easy to make. I had my young boys do most of the work after I prepped it. We added Italian sausage and served with lots of veggies on the side. We will most definitely make again. Thank you! Great way to get them involved! I am glad it was a hit! Thank you! I tried this recipe for the first time tonight and it was delicious. This will be in my rotation for sure. Thanks for sharing the recipe. Yay! Love hearing that! Thank you so much for trying it & letting me know! This is good but I don’t know why milk was used instead of heavy cream to make the sauce. I of course made it with the cream. Better with the cream. Sometimes, when I am out of cream, I will use the milk. And, that is what happened for this recipe. But, both work great 🙂 Thank you for trying it! Excellent recipe!!! My family loves it. I also added shrimp and spinach. Thank you & yes, that would be perfect! Such a good recipe! So glad I tried it! Thank You for posting. You are so welcome! Glad to share. I am glad you like it! That’s why we love it!! Thank you so much! This recipe was not my favorite. It was very dry. I followed it step by step so I’m guessing something happened that went wrong but I’m not sure what. Everyone else said it was delicious so I not sure. Hi! I just made this today & cut everything to 50% since it’s just for 2 people. Half a box of pasta, 1.5 tb butter, 1 tsp minced garlic, 1.5 tb flour, 1.5 cup broth, 1.5 milk, 1 tsp parsley, and 1/4 cup parmesan cheese. End result- it didn’t look like there was enough sauce for half a box of pasta. The sauce was only enough for maybe maybe.. 1/4 of the pasta. Did I do something wrong? After I did step 4, the flour made the garlic/butter into little clumpy balls. So I added milk/broth which helped but there was not a lot of sauce to use. Any advice would help! I’m a total newbie in the kitchen. You are so welcome!! I am glad to share! Thank you for letting me know! This was a very easy and very good pasta dish. All members of my family enjoyed dinner tonight. That’s the best! Thank you for sharing that! The food looks delicious and attractive, I like this dish, it’s great. What is the serving size of this recipe? Needed to gauge the nutrition. We love pasta at our house & i’m always looking for some new recipes. I tried this one for my family & they loved it. It is so creamy. Great addition! I am so glad you like it! Thank you! i love this paSta dish. 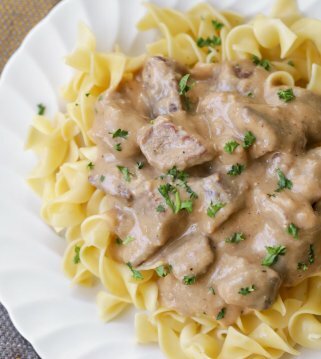 Its creamy and simple to make. As a side or a main dish. Cant go wrong! This is my favorite homemade pasta recipe! So flavorful and creamy! Definitly a family favorite in our house. The kids CAN’T get enough of it! Thanks! I made this, and it was excellent! The only thing I tweaked a little, is, that I didn’t used as much garlic because my husband is picky. He loved it. Thanks for sharing. You are so welcome!! Glad he loved it! Thank you! This looks ABSOLUTELY amazing! I do have a question though, is the chicken Broth optional? I don’t believe i have any on hand, but i would love to make this! I am sure it could be 🙂 I haven’t left it out, but I would substitute some liquid. It could be water or if you have chicken bouillon, I would mix that in with the water. You could use another broth, too, if you have others. We love pasta! This recipe is so eaSy and good. Its one of my go to recipes when were looking for pasta. This is amazing! A new favorite in my house! My husband loves garlic recipes. can’t wait to make this for him for dinner this week! Looks like the perfect dinner I cannot wait to try it! this is perfect! 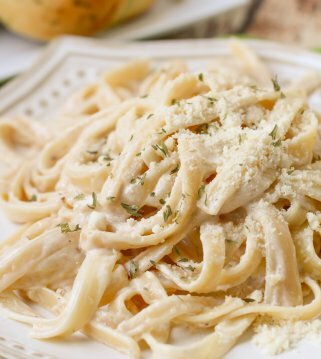 i’ve Been meaning to find a simple recipe for alfredo – so much better than canned!! My kids love pasta so i usually serve Sometype of dish each week. Sometimes we hAve pasta twice in a week! IM always on the look out for another reciPe to add to the rotatiOn. This one made the cut. My family loved it! 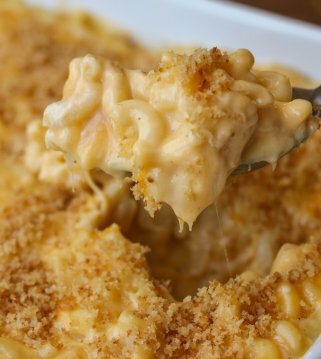 This is one of the easiest & cheesiest dishes! My family loves it! I usually make a pasta, one night a week & this will definitely go into the rotation. I made this last night as a side dish. Fairly simple to make and tasty. a whole pound of pasta is too much for my family so i only prepared 8 oz. I still made the whole recipe for sauce. i used a little over half for the pasta and used the rest to pour over some roasted chicken breast. i only had 1% milk and was worried my sauce may not thicken up but it did just fine. made this last night and am so sad I didnt make a double batch. We DEvoured every last drop of it and needless to say I’ll be making this again! It was so easy and yummy! 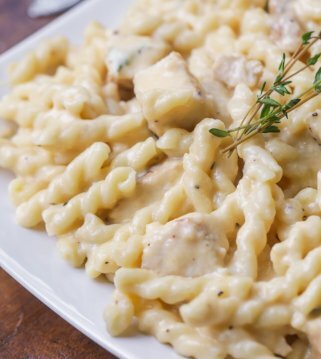 You can never go wrong with creamy pasta! This looks absolutely heavenly! I love how creamy this is! My family loved it!! Pasta is always a winning dinner idea in our house. So delicious and creamy! 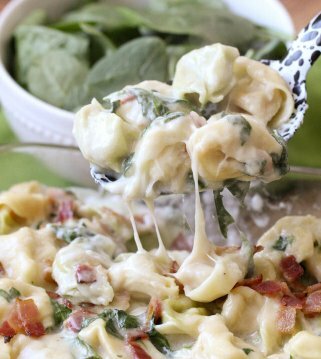 Love how creamy this pasta is! Perfect weeknight dinner! my daughter loves noodles and anything pasta!! she was so excited to make this. It is easy and delicious! Thanks for sharing! Cooked up really well. TOPPED with Grilled chicken breast. Next time i may add some blistered cherry tomatoes. Perfect!! I am so glad you tried it! Thank you so much! Hi, i liked your recIpe aloT specialliy using the Stock😊. My question if i needed a thicker saucE what should i do.😊. Thank you 🙂 You could add a little more flour or a little less of the milk & broth, to make it thicker. You are so welcome!! Glad you liked it!! Thank you!